It’s summertime and thanks to the glorious weather, we have an abundance of juicy fruits coming into season. 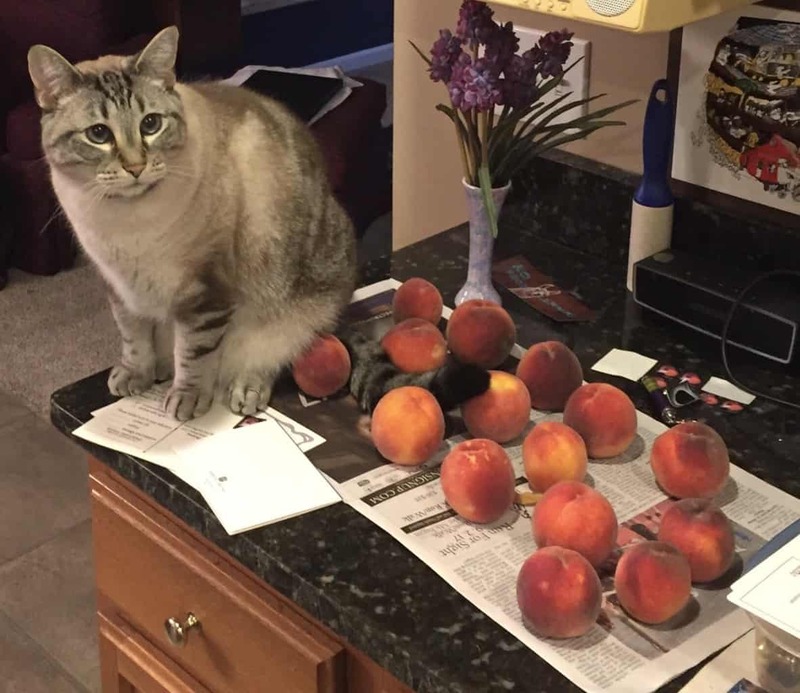 But one cat is more excited than most for peach season. 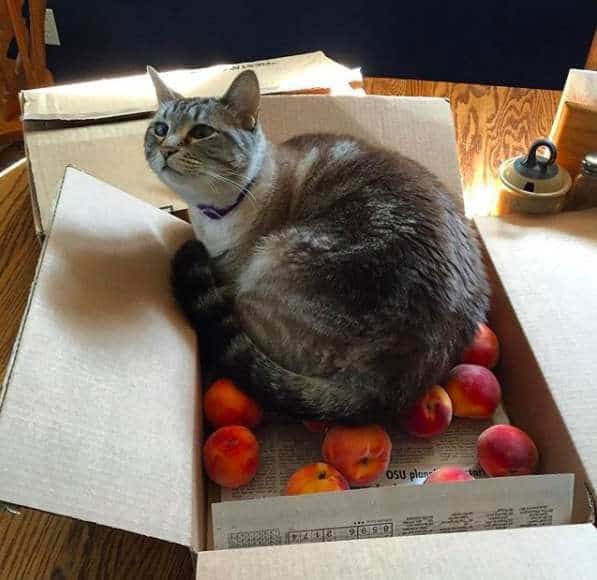 Ozzy the 5-year-old tabby cat loves peaches, and when I say ‘loves’, I mean LOVES. He doesn’t like to the eat them though; he loves to sleep on them. For Ozzy, no mattress can live up to the fuzzy warmth of a bed of peaches. Lydia’s family grow peaches, which is perfect for Ozzy as he has no end of access to his favorite fruit. He was introduced to them the first peach season he came to live with Lydia’s family. He discovered them on the table and immediately started rubbing on them. So we can safely say that it is the feel of soft peaches that Ozzy adores. The Coutré family adopted Ozzy back in 2013 when Lorraine and her mother volunteered at the Harbor Humane Society in Michigan. 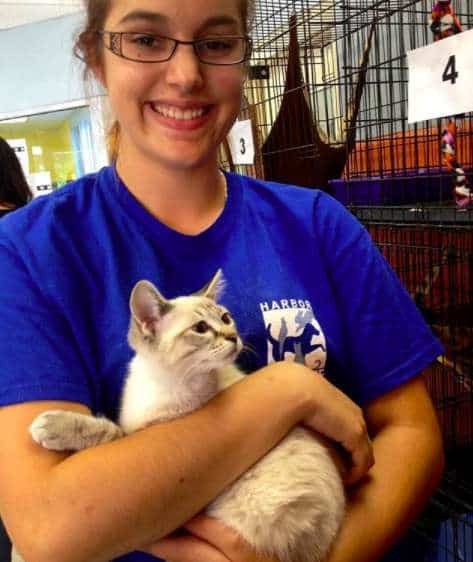 They had no intention of adopting any animals, but when they wandered in the cat enclosure everything changed. As soon as Lorraine spotted Ozzy, it was love at first sight and they walked away with him that day. The family leaves the peaches to ripen on sheets of newspaper, but Ozzy uses this as a perfect opportunity to make a nest. This has forced Ozzy’s family to resort to desperate measures to preserve their produce (and keep them free of cat hair). 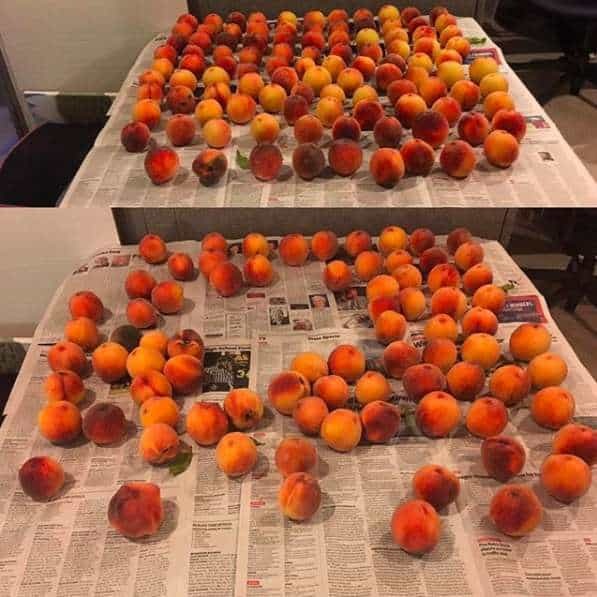 My mom once put the peaches in the basement to keep them away from Ozzy. But he still found them and left a cat-sized hole in the middle of what were previously neat rows of peaches. You may be wondering whether it is all circular fruit that Ozzy loves, but the family has already tested this theory. They have tried introducing him to other fruits but he turns his nose up in disgust and runs away. He particularly hates clementines. 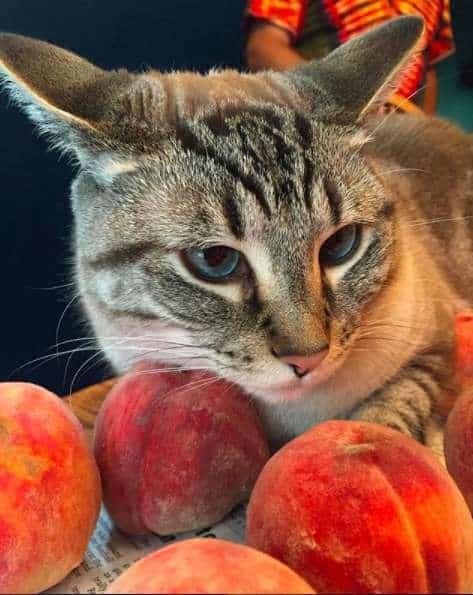 This cat loves peaches more than anyone. Ozzy’s odd love affair has become a long-running joke with the Coutré family. They share photos in the family group chat of Ozzy sleeping with the peaches, much to the delight of the Coutré daughters. Eventually, Lydia Coutré couldn’t keep Ozzy’s antics to herself anymore and she posted some photos to Twitter. Within a few days, Ozzy’s post had gone viral. Now everyone knows about Ozzy’s strange love affair. Regardless of his new-found fame, Ozzy doesn’t care about the attention he’s been getting. 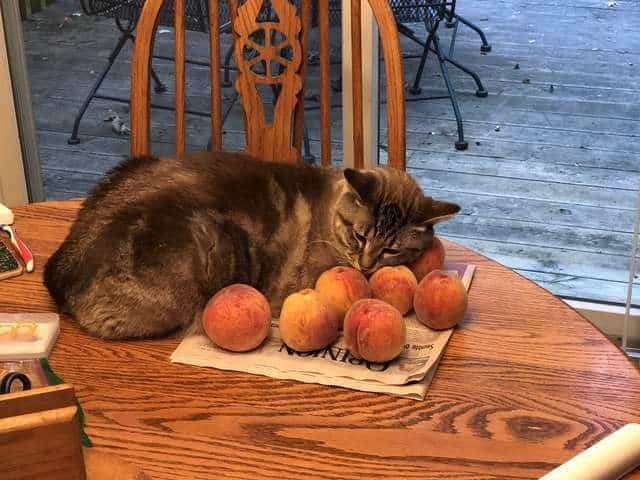 All he cares about is making the most of his beloved peaches before the season ends. Luckily, his owners are thinking ahead about how to get him through the winter. I’m just glad the internet loves him as much as we do. And perhaps we’ll buy him some out-of-season peaches to keep him company.